The federal government’s controversial $444 million grant to the Great Barrier Reef Foundation (GBRF) has rocked scientific and environmental circles..
Like peeling an onion, the further we strip away the layers surrounding this scandal, the more the tears will fill our eyes – tears of anger and disbelief. The outer layer comprises the so-called “captain’s call”, the supposed thought bubble in the head of Prime Minister Malcolm Turnbull that led to the massive allocation of funds to a body that had not sought it, bypassing any tendering process or due diligence requirements. The largest-ever non-profit grant in Australia political history went to an organisation with a staff of 6 people accustomed to an annual budget of $8 million. The Foundation’s managing director Anna Marsden claimed that the grant was a “complete surprise”. It really beggars belied that Turnbull would “surprise” the Foundation with this massive grant. However, its Board is stacked with Business Council figures and other corporate identities. Any one of them could have initiated a private conversation with Turnbull or his minister Frydenberg without formal paperwork being completed. The ruling class is quite adept at discussing its tactics in this way. The process may have lacked finesse but probably reflects a government desperate to stave off international criticism of the damage to the reef by bank-rolling a safe outfit stacked with fossil fuel identities. Peeling off a bit more of the skin, we find the Foundation paying lip-service to the impact of climate change on the reef but avoiding activism around the issue. Michael Myer of the Myer retail family, a former Board member of the Foundation said the Government was "greenwashing" by using the GBRF "to be seen to be doing something for the reef" but via an organisation that would not be "unduly politicising it around climate change". This is certainly the impression the GBRF’s website gives: “Our focus in the short term is on boosting the resilience of the Reef to allow it to bounce back from major challenges as a result of a changing climate and declining water quality. We’re buying the Reef time while the world works to meet the conditions of the Paris Agreement. The previously quoted Michael Myer was a financial supporter of the GBRF and a member of its board for two years until 2002, when he quit in part over concerns about its "corporate" direction and the growing involvement of figures from the fossil fuels industry. The GBRF has eleven research partners including the federal and Queensland governments, BHP, Boeing, Lendlease and Rio Tinto. It has fifteen Foundation partners, mostly from the very big end of town including giant commercial law firm Allens Linklaters, Deloitte, KPMG, Pricewaterhousecoopers (PwC), US advertising giant Leo Burnett, Google and the National Australia Bank (NAB). So, these are the two areas of corporate partnership, and there is no shyness about focussing the GBRF’s research around the interests and methods of business. The next layer is the Chairman’s Panel. This is a 56-person group of corporate Presidents, CEOs and Managing Directors able to visit the reef, learn about efforts to protect it, and “lend their personal and organisational expertise to the science we support.” That is, not just any science, but the science we support. 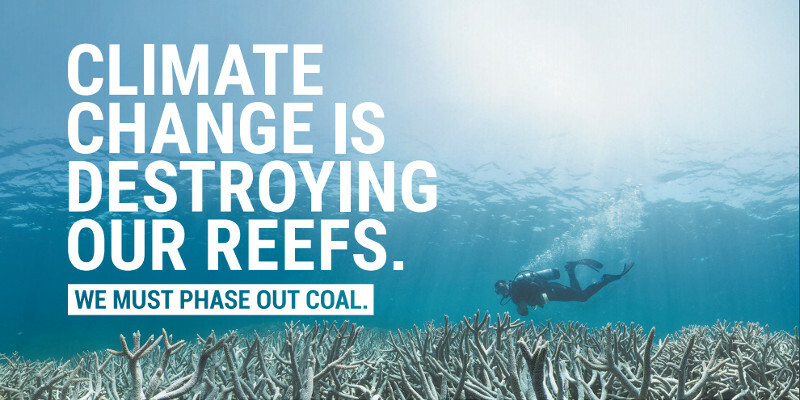 The science that is about reef resilience, not climate change activism. Among the luminaries on the Chairman’s panel are electricity and gas giant AGL, packaging giant AMCOR, rail freighter Aurizon, energy and resource sector services provider Ausenco, BHP, Boral, US oil and gas giant ConocoPhillips, Downer Group (infrastructure and mining, and owner of the notorious Spotless), US giant GE, construction, property and infrastructure company Lendlease, Orica (supplier of explosives and cyanides to the mining industry), the largest coal company in the world Peabody Energy, WorleyParsons (provides project delivery and consulting services to the resources and energy sectors) as well as a host of major banks and insurance companies). The Chairman of the Chairman’s Panel and of the GBRF itself is Dr John Schubert, Chairman of Garvan Institute of Medical Research and a Member of the Business Council of Australia. He commenced his career with Esso Australia as a professional engineer holding various positions in Australia and overseas. In 1983 he was appointed to the board of Esso Australia; in 1985 John became Esso's Deputy Managing Director and in 1988 Chairman and Managing Director. He has also held the positions of Managing Director and Chief Executive Officer of Pioneer International Limited (1993-2000) during the time that Pioneer had ownership of AMPOL (later sharing its ownership with Shell) and at the time in Dec 1999 that Pioneer was taken over by the British giant Hanson. He was President of the Business Council of Australia (2001 - 2003). He was previously Chairman of the Commonwealth Bank of Australia and Worley Parsons Limited, and Director of BHP Billiton Limited, Qantas Airways (during its furious attack on workers’ rights in 2011) and Hanson plc. Just the sort of person to advocate climate change activism – NOT! BHP is represented on the Board by Chief External Affairs Officer Geoff Healy. Lendlease has Steve McCann. Managing Director Anna Marsden has a corporate leadership background. The scientific community is represented through Russell Reichelt, Chairman of the Great Barrier Reef Marine Park Authority, who has a PhD in marine science, and Prof. Ove Hoegh-Guldberg a biologist who is the inaugural Director of the Global Change Institute at the University of Queensland. There is also John Gunn, a marine scientist with over 35 years’ experience conducting, leading, translating and communicating science, focussed on conservation and sustainable use of marine ecosystems and resources. That’s three scientists out of six members so far. Let’s keep peeling back the layers and see who else is on the Board. Firstly, there is Grant King. King has extensive background in fossil fuels. He was Managing Director of Origin Energy Limited from February 2000 until his retirement in October 2016. He was formerly General Manager, AGL Gas Companies where he held a number of management positions over a 17-year period. King was elected President of the Business Council of Australia in November 2016. In addition to his role at the Business Council, he is the Chairman of the Melanoma Institute of Australia, a Director of the Origin Foundation and is a member of the University of NSW Foundation. He also holds a position as Professor of Energy Engineering in the School of Photovoltaic and Renewable Energy Engineering at the University of NSW and runs his own advisory business, GK Advisory Pty Ltd. He is former Chairman of Contact Energy Limited, Oil Company of Australia and the Energy Supply Association of Australia (esaa). He is a former Director of Envestra Limited and the Australian Petroleum Production and Exploration Association Limited (APPEA). Next is former Queensland University Vice-Chancellor Paul Greenfield, a chemical engineer. Greenfield resigned from his position at the University on 13 January 2012 in the aftermath of what was known as the UQ admissions scandal. The scandal related to an "irregularity" in the enrolment of a student in the medicine course who was a "close relative" of his. It was subsequently revealed that the "close relative" was in fact his daughter, Charlotte Greenfield, who was offered a place in the medicine course despite not having met the entry requirements and being ranked below 343 other applicants who were not admitted. Then there is Michael Cameron who comes with a background in finance capital. Cameron was appointed CEO & Managing Director of insurance giant Suncorp in October 2015. He was a non-executive director from April 2012 to September 2015. He was previously CEO & Managing Director of The GPT Group (2009 – 2015), Chief Financial Officer at St George Bank from mid-2007 until the sale to Westpac Banking Corporation in 2008, Group Chief Financial Officer of the Commonwealth Bank of Australia, then Group Executive of their Retail Bank Division. He also spent 10 years with Lendlease in a number of senior positions, including Chief Financial Officer at MLC Limited. He is Chairman of the Financial Sector Advisory Council. Maureen Dougherty, president of Boeing Australia, New Zealand and South Pacific is next. She has experience in armaments, having previously served as vice president and program manager for the KC-46 Tanker, the Airborne Early Warning & Control (AEW&C) surveillance aircraft, and the F-22 fighter programs. She is chairperson of the American Chamber of Commerce in Australia and a board director of the United States Studies Centre at the University of Sydney. She is also a member of the Business Council of Australia. Another with a background in finance capital is Stephen Fitzgerald. He was Chairman of Goldman Sachs, Australia and New Zealand, having joined the firm in 1992 and is promoting the spurious concept of social investment bonds. Amanda McCluskey also has a background in finance capital and in taking a business focus to climate change. McCluskey is the Head of Sustainable Funds Group and Chair of Stewart Investors where she is responsible for leading and supporting the investment strategy and research process. Prior to this, Amanda was Head of Responsible Investment at Colonial First State Global Asset Management and also gained fund management experience at Portfolio Partners and BT Financial Group. She was the founding Deputy Chair of the Investor Group on Climate Change, was on the board of the National Climate change Adaptation Research Facility and the Climate Change and Business Centre. Another with combined links to finance capital, fossil fuels and the Business Council of Australia is Steve Sargent. Sargent joined the Foundation Board in March 2015. He is a Non-executive Director of Origin Energy Ltd, Chairman of the Origin Foundation. Steve is also Chairman of OFX Group Ltd (since November 2016) and is a Deputy Chairman and Lead Non-executive Director of Nanosonics Ltd.
Over recent years Sargent has been a Non-executive Director of Veda Group Limited (2015–2016) and Bond University Ltd (2010–2016). He was also a member of the Australian Treasurer’s Financial Sector Advisory Council, President of the American Chamber of Commerce and a Director on the Board of the Business Council of Australia. Sargent’s most recent executive role was President and Chief Executive Officer of GE Mining, GE’s global mining technology and services business. Prior to this he was responsible for all of GE’s operations (Aviation, Healthcare, GE Capital, Transportation, Power & Water, Energy Management) across Australia and New Zealand, GE’s third largest country in the world. He joined GE Capital in 1993 in New York City and held a number of global leadership positions with the company, spanning the US, Europe and Asia. Finance capital and fossil fuels are also in the background of Philip Strachan. Director of the Foundation since 2003, Strachan is Chair of the Audit, Risk & Compliance Committee and member of the Bond Committee. He spent 35 years working for the Rio Tinto Group in numerous finance roles including in the head offices in London and Melbourne and also in Jakarta, Indonesia. He was Chief Financial Officer at Rio Tinto Aluminium for six years based in Brisbane, then Chief Financial Officer at Rio Tinto Alcan based in Montreal. He then became President and CEO of the Bauxite and Alumina global business unit of Rio Tinto up to his retirement from Rio Tinto in 2016. Last, but not least is Olivia Wirth. Wirth came to prominence in 2011 when Qantas boss Alan Joyce stood down all Qantas employees, grounding the entire fleet in a bitter attack on workers’ rights and conditions. Wirth was his outspoken and provocative spokesperson. She later married Australian Workers Union head Paul Howes in a society wedding attended by Labor leaders Gillard and Shorten. Wirth is a former political adviser to former Liberal Treasurer Joe Hockey. Investment banker Stephen Roberts was also on the GBRF’s Board until recently. Roberts was Citigroup’s former country head and has been a director of the GBRF since 2015 at which time he was allegedly involved in a criminal cartel with the head of Deutsche Bank during a $2.5 billion deal to raise capital for the ANZ Bank. Deutsche Bank is also on the Chairman’s Panel of the GBRF. Not counting Roberts, that is three scientists on a Board of 15, all of the others sharing links to finance capital and fossil fuels. Not represented are First Nations people and genuine activists for environmental protection and against climate change: Wilderness Society, Australian Conservation Foundation, Greenpeace, Sea Shepherd and others. Giving $444 million of taxpayer’s money to this shandy gang of corporate creeps to masquerade as champions of our Great Barrier Reef is bad enough. What makes it worse – another layer that needs to be peeled off – is that some of these corporate giants are amongst the greatest tax minimisers and tax non-payers in Australia. BHP had an Australian income of $1.3 bn in 2015-6. It paid no tax. Lendlease had an income of $7.9 bn for the same financial year and paid no tax. Qantas paid no tax on $15.7 bn. PwC paid no tax on $463 million. AMCOR paid no tax on an income of $3.5 bn. Ausenco paid no tax on $115 million. ConocoPhillips had an oncome of $1.4 bn and paid no tax. GE’s various entities paid no tax on $800 million. JP Morgan paid no tax on $663 million. Peabody paid no tax on $2.8 bn. Shell paid no tax on $4.2 bn. WorleyParsons paid no tax on $11.4 bn. Others paid minimal tax and the figures are much the same for the other two financial years for which we have data (2013-4 and 2014-5). At least WorleyParsons had the decency in 2014-5 to cough up $20,000 on an income of $1.8 bn! Had some of these companies paid tax on their Australian earnings, a government committed to independent scientific research (ie not just the” science we support”) would not have needed to slash funding to the CSIRO or sack one third of its biodiversity staff. That government is not the current Australian government. Our government is anti-science and pro-corporations. It bankrolls tax-avoiding multinationals to offer “resilience” to a dying national treasure. It is palliative care, soothing the reef’s dying pillow so as to not disturb the essential operations of a profit-driven system. We should be incensed at the fraud that comprises the funding of the GBRF. It should be taken back and made available to those who are committed to the fight against climate change, and against fossil fuels. Ultimately, only an independent and socialist Australia will restore the balance between humanity and nature and put an end to farces such as offering “resilience” to a dying reef.